Boston College field hockey had the second-strongest schedule in the country last season. From the looks of the team’s 2017 opponents, the Eagles could very well match that ranking this fall. BC is slotted to play seven participants from last year’s NCAA Tournament and 12 teams ranked in the final 2016 NFHCA poll, including six of the top seven. For the third-consecutive year, the Eagles will begin their season with a pair of scrimmages against Massachusetts Lowell and Boston University. On Aug. 18, the River Hawks will travel to Newton, and just two days later, BC will trek to the other side of Commonwealth Ave. to play BU. BC’s scrimmage against the Terriers will serve as the first of two meetings between the crosstown rivals this season. The regular season officially starts on Aug. 25 when Quinnipiac comes to town. Over the past 11 years, the Eagles have handed their Metro Atlantic Athletic Conference foes just as many losses. Then, two days later, BC will make the trip to New York to play Albany—the same team that the Eagles downed in the first round of the 2015 NCAA Tournament. From Sept. 1 to Sept. 4, BC, along with Duke, Maryland, and Northwestern, will partake in the third-annual ACC/Big Ten Cup. The early-season tournament is played in the The Spooky Sports Nook in Lancaster, Penn.—the home of USA Field Hockey. In each of its two previous seasons, the Eagles have also played the Terps and Wildcats in this tournament. Last year, they dropped both games, but in 2015, BC picked up an overtime win against Maryland. ACC play will kick off on Sept. 8 when the Eagles host Syracuse. BC hasn’t beaten the Orange since Romee Stiekema netted a game-winning corner in overtime of the teams’ 2014 matchup. A few days later, on Sept. 10, BC will play another home game, this time versus Providence. Last year, Lucy Lytle single-handedly carried the Eagles to victory against the Friars. In dramatic fashion, she scored the second of her two goals with less than a minute to go in the second overtime period. About a week later, BC will head south for a four-game road trip. It starts with the Eagles’ Sept. 16 game against last year’s national runner-ups—North Carolina. BC is fresh off its first win over the Tar Heels since 2008. The next day, the Eagles will travel to William and Mary for the beginning of a three-game stint in Virginia. BC hasn’t played the Tribe in close to a decade. Back in 2009, the Eagles’ offense exploded against William and Mary, outshooting the Tribe 16-5 and, ultimately, finding the back of the net seven times. On Sept. 22, BC will resume conference play when it faces off against Virginia. The two sides have split the last four regular season games—three of which have reached overtime. Finally, the Eagles will take on Pacific before returning to Newton. BC hasn’t played the Tigers since it defeated them 3-1 in 2007. Last season, Pacific finished 16-5 and recorded wins against quality ranked opponents, like Stanford and Albany. To wrap up September, the Eagles will host Duke on the 29th. Recently, the Blue Devils have had BC’s number. The Eagles haven’t defeated their ACC foe since 2012, and Duke has held BC to two goals or less in each of the last five meetings. On Oct. 1, the Eagles will make their way to New Hampshire to play the Wildcats. BC has won its last five games against New Hampshire, and it hasn’t been close. The Eagles have outscored the Wildcats 19-7 in those contests. After that, BC will return to campus for a three-game homestand against Louisville, Harvard, and Northeastern. The Cardinals arrive on Oct. 6 for a key ACC matchup. The Eagles are 2-1 in their last three games against Louisville, and in both of their victories, BC has limited the Cardinals to just one goal. Then, on Oct. 8, the neighboring Crimson will bus over to play the Eagles. Dating back to 2012, BC has only conceded a total of three goals to Harvard in its five wins over the Crimson. Five days later, Northeastern will venture to the Heights. Just one year ago, the Eagles scored a season-high eight goals in a commanding win over the Huskies. BC will conclude its regular season with three games on the road. Fortunately for the Eagles, two of their opponents during that stretch are in New England. On Oct. 15, BC will once again face off against BU. In both 2015 and 2016, the two teams have needed overtime to settle their differences. Last year, the Terriers prevailed after 70 minutes of scoreless play when Madeline McClain whipped up a game-winner in the first period of extra time. BC’s sixth and final conference game will be played at Wake Forest on Oct. 20. 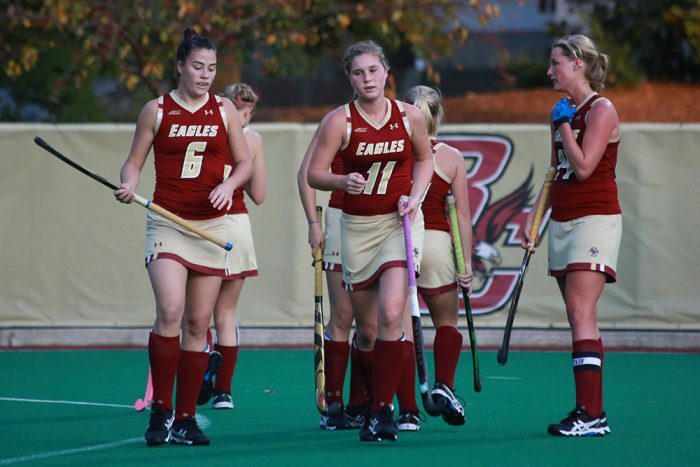 Each of the past three games between the Eagles and Demon Deacons have been decided by one goal—including BC’s 4-3 double-overtime win in the first round of the 2015 ACC Tournament. The Eagles regular season will come to an end on Oct. 29 when they take on 2016 national semifinalist Connecticut. Following a shootout victory over the Huskies in 2014, BC dropped all four of its most recent matchups against UConn—two of which have come in back-to-back NCAA Tournaments.